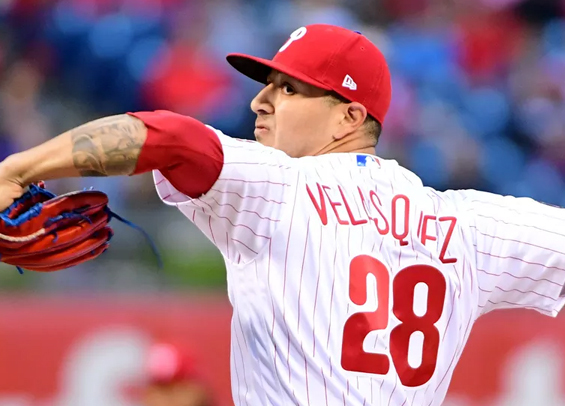 Vince Velasquez took a step forward in solidifying his role in the starting rotation on Monday, tossing five solid innings while surrendering two runs at the Phillies beat the Nationals in the series opener at Citizens Bank Park, 4-3. “I started off a little bit shaky,” Velasquez said. “Then I kind of settled in toward the end. J.T. (Realmuto) and I were linked up all the way through. I made one mistake pretty much." Rhys Hoskins carried the offense, hitting a pair of homers to lift the Phils to their seventh win of the young season. His two-run shot in the eighth proved to be the difference. “He is, in many ways, the heartbeat of our club,” manager Gabe Kapler said. Hoskins is hitting .367 with five home runs, 15 RBIs and a 1.446 OPS through the Phillies’ first nine contests. The bullpen helped too, with Seranthony Dominguez tossing a perfect sixth inning while Adam Morgan and David Robertson took the next two frames. Pat Neshek encountered some bumps in the ninth, surrendering a homer and a double, but was able to secure his first save of the season and the 14th of his career. Aaron Nola has struggled in his two outings this season, so he'll look to turn things around on Tuesday night. He's allowed seven runs in nine innings, walking seven while striking out 10. The Nationals counter with Stephen Strasburg.